Please join us for a plaque ceremony presented by the U.S. Green Building Council's Detroit Regional Chapter, honoring the University of Michigan Taubman College of Architecture and Urban Planning for achieving LEED Gold certification on the new A. Alfred Taubman Wing of the Art & Architecture Building. Note: This event is hosted and sponsored by USGBC Detroit, but we believe this will be of great interest to AIA Huron Valley Members. Please be sure to register at this link. 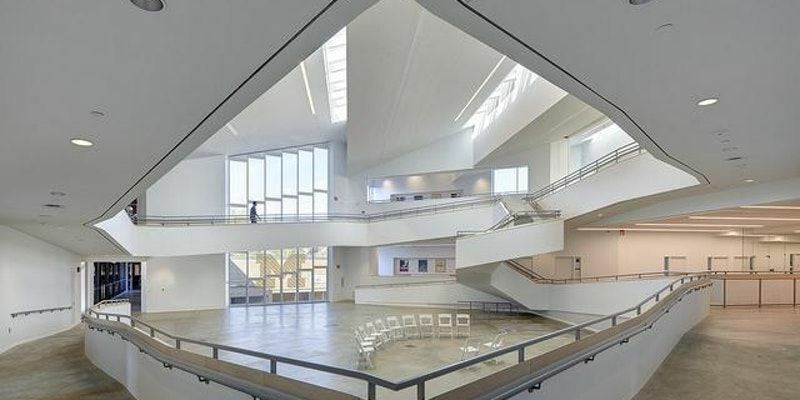 Following the plaque presentation, Kevin Marshall of Integrated Design Solutions of Troy, the project's Architect of Record, will present on the sustainable features of the A. Alfred Taubman Wing. Following the presentation, IDS will lead tours of the building addition with a focus on the building's sustainable features. Originally proposed in 2009, the renovation was the first modification to the Art and Architecture Building since its completion in 1974. The original building was designed by Robert Swanson of Swanson Associates, Bloomfield Hills, MI. The design architect of the addition is Preston Scott Cohen Inc., Cambridge, MA. The Architect of Record, Integrated Design Solutions, is an architectural firm based in Troy, MI, led by President Paul Stachowiak (B.S. '76, M Arch. '77). Construction was done by Christman Constructors, Inc., Livonia, MI. This event is registered for 1 LEED BD+C Specific CE and 1 AIA LU/HSW Credit.